Today we want to pull back the curtain about the development process a bit, in order to talk about two feature updates that our engineers have been feverishly working on - better dynamic placeable objects and a more robust Preview Window. Both will be included with Game Update 5.10.2 ‘Heralds of Victory’. To really explain the breadth of this update, we’re going to try something a little different from what we normally do and go deeper into the tech-side of our explanations. With that, let’s dive in! First off, let’s talk about what DYNs are. DYNs are objects that designers place in the world that can change or be changed, based on how they’re set up. 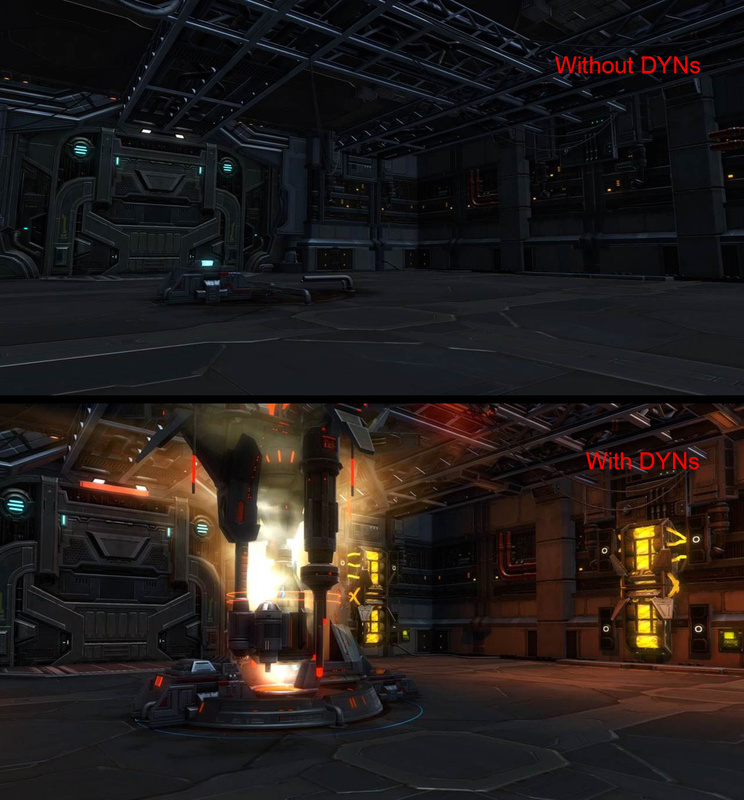 Nearly everything you interact with in-game is based on a DYN. Really! A Mission item that a player interacts with, or an elevator switch are both examples of interactive DYNs. Lights on a wall or a neon sign, while they aren’t interactable, are DYNs that help us build the game world. In the past, every single element and property of these objects had to be individually hand-crafted by a designer. This made creating DYNs a complicated, unwieldy, and lengthy process. It also made it much easier for bugs to slip through and make their way into the live environment. Imagine that a bug appeared when interacting with an NPC and the fix was to move them to another location on the map. On paper that sounds easy, but unfortunately, it’s not always that simple. To explain all of this, we are going to set up an example involving a Non-Playable Character (NPC) and some triggers, things that set off an event or action. This NPC could have several DYNs tied to it – lighting, audio triggers, an interaction trigger, etc. Taking it a step further, all those triggers could then be tied to others, thus creating a much more complicated web of fixes. Let’s put all of this into an actual situation now. Taking our mentioned NPC, let’s say when you interact with it, a nearby wall blows up. That wall is another DYN with its own set of effects, connected to this sequence of events, each of which may be tied to yet another DYN with its own set of effects. You can see how this could quickly get out of hand and require hours of work for what would be, in theory, an otherwise “simple” fix. While the team was looking down the road at future content, it was clear that these changes to the DYN system would be very beneficial to help facilitate those plans. By improving on this system now, it helps our designers with the future content we have planned. So, how are DYNs going to be changed? We’re taking what are all individually separate entities (our previously mentioned NPC and wall for example) and packaging them together into a single item. By doing this, we will refine, polish, and optimize the entire process. In turn, this makes the development process for making new DYNs much shorter! This all leads to us being able to to build and work with objects in the game more efficiently, while lowering the chances of introducing new bugs throughout the process. In general, the system is highly expandable, which opens the doors for our team to create and implement a lot of things that were previously impossible. Something the community has requested for a long time are interactable Stronghold decorations. Imagine your whole Guild meeting up and leaning across the bar, sharing drinks after the latest successful run. While this idea is not a guarantee, it should help paint the picture for things that we can do that never used to be possible! Now let’s talk about one of the most longstanding frustrations that both players and members of our team have struggled with since the game launched: the preview window. The preview window has been part of the game since its release and has had its fair share of bugs over the years. For example, did you know that the preview window is currently incapable of showing any visual effect (VFX) in the game? This weird limitation shows itself in several ways, from the previewer showing black textures in place of the VFX, to not showing anything at all (we’re looking at you, A7 Surveillance Drone and your missing arms). The way the preview window was originally built didn’t lend itself well to being expanded upon with new functionality or item types. When Strongholds came out, for example, the decorations previewer had to be built from scratch, rather than being integrated within the existing window. Over time, the window became so complex that we had built up a backlog of over a thousand bugs. Unfortunately, we knew we’d never be able to fix all of these, since it would mean less time devoted to developing new features for the game. A few months ago, we decided that enough was enough and this was the right time to rebuild it from the ground up. In order to lay the groundwork to make our system sustainable for years to come, we wanted to rebuild the Preview Window at the same time we were updating our DYNs. In addition to a full rewrite of the underlying code, our engineers have also added lots of new functionality to the preview window! These range from slight changes like player characters now appearing on mounts, instead of standing off to one side, to bigger ones. An exciting feature that we’ll be adding is a button for animating the previewed object - running, mount flourishes, and weapon/combat animations. You’ll also see that there’s an entirely new UI to better relay what equipment, mounts, and pets are currently being previewed in the window. Want to know how a specific emote or mood would look on a character before purchasing? Emotes, moods, and rest and recharge actions will also be supported by the new Preview Window. Decorations with VFX like the Dread Fortress Portal will now show their actual effects, rather than a big, black blob. And A7 finally got his arms back! Optimizing DYNs and rebuilding the Preview Window allows us to move forward with some exciting plans we have in the future, all while improving the efficiency of the tools we work with. Better quality features that also reduce the chances of encountering bugs? Sounds like a win/win situation! We can’t wait for everyone to get their hands-on Game Update 5.10.2 ‘Heralds of Victory’ and we hope you’ve enjoyed this peek behind the curtain into how some of our systems work. ← Prev news: Game Update 5.10.2 ‘Heralds of Victory’ Is Coming!